Wondering what to get that 80's fan on your Christmas List? Tired of picking through a bunch of Rhino re-issues in the cut-out section of Wal-Mart just to find a vaguely appropriate gift? Well, I have the solution for you. I was shopping for gift boxes at Big Lots recently when I happened upon this little gem. It's a Joan Jett and the Blackhearts semi by Hot Wheels. Apparently, the Tour Haulers line also boasts semi trucks for AC/DC, KISS and The Who, so you can match the band to the fan you're buying for. As a child who spent most of his formative years listening to music in the 80's, I appreciate the kitsch value in these things, especially the Joan Jett one. 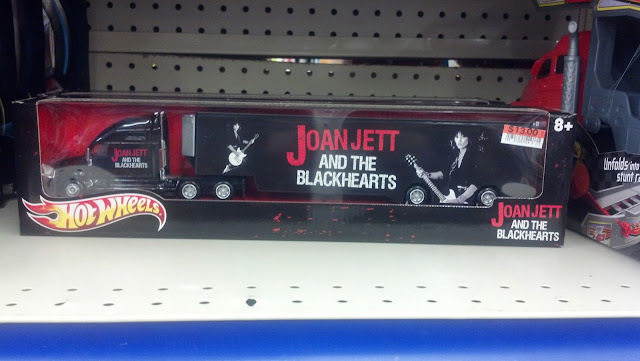 The thing is, the product is recommended for children from 8-13, most of whom probably have no idea who Joan Jett is. It is also heavily marketed to "Joan Jett fans who are also Hot Wheels collectors" which you would think would be two parts of the population that seldom intersect. The Glorious Results of a Misspent Youth?